Do not let yourself starve in Spain. There are more than three meals during the day but probably mealtime is far different from your norm. Many tourists are frustrated looking for an open restaurant at 11am for lunch or 6pm for dinner. Many others adapt and could not enjoy the trip more. Wish to know the difference? It is knowing when Spaniards eat and how. For most Spanish, breakfast should not be heavy. In order to keep you energized until lunch, Spanish have it twice, not one. The first breakfast is light, usually with a toast, fruit, milk or hot chocolate. The second one contains a coffee and pastry as a croissant or sandwich with ham or cheese. Pan con Tomate: Bread with tomato, drizzle with olive oil and sprinkle with salt. Many bars and cafes offer an extraordinary menu for breakfast, around 2.5€ to 3€ for a croissant and a tea or coffee, which is very reasonable. As the office in Spain usually starts at 9am, locals are likely to have the first breakfast from 7am to 8.30am and the second breakfast from 10.30am to 11am. Do it like locals: Take a sit and savor your breakfast in any bar or bakery in your surrounding areas. Take it slow as that is the style. 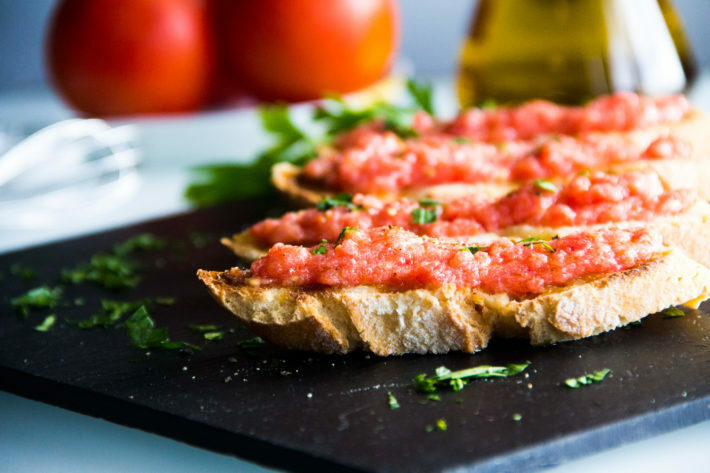 Also, remember to try the classic Spanish style toast pan con tomate, a toast with tomato and olives oil. Let’s face it, people have lunch very late in Spain, from 2pm to 3.30pm. Only until 1pm at the earliest that many restaurants open their kitchen. Lunch is served until 4.30pm. If possible, go for a siesta (a nap after lunch) as it is how Spanish do. Do it like locals: Look for the “Menú del Día” as a complete meal with starter, main dish, a drink and a dessert costs around 10€ only. By this way, you are tasting a little bit of traditional Spanish dishes. Paella is highly recommended and it is usually on the Menú del Día on Thursday. This is the snack right after work, which is from 5pm to 7pm. 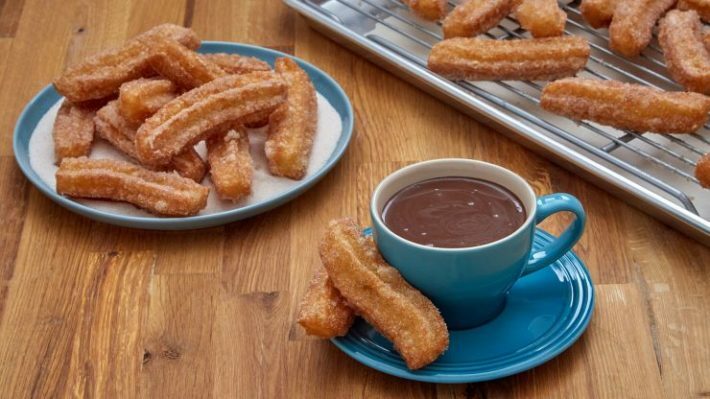 Some people go for a sweet menu with churros and hot chocolate. Otherwise, a fruit salad box in the Boqueria Market could be a health and green option. In fact, it could be anything. You may start to wonder, “Ok, when can we have dinner”? Just keep calm and go for a tapas hour, which is about 8pm to 10pm. Fun and socializing are what tapas hour is all about. 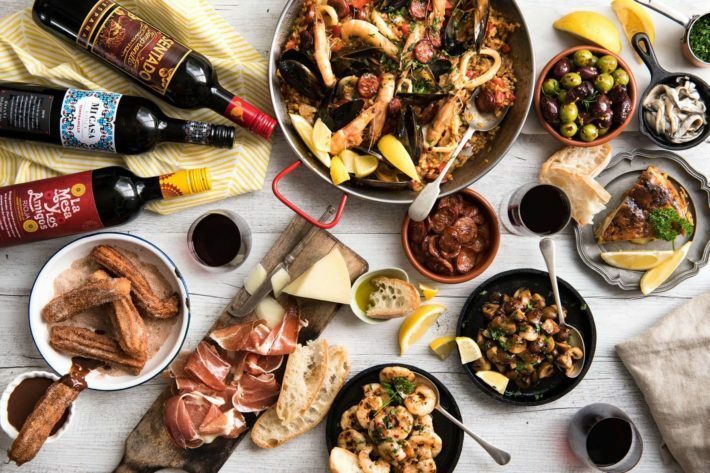 There are two ways to savor tapas, either standing on the bar or sitting down on a table with a glass of beer or drink. However, there is only one way to truly enjoy it, that is to savor with your beloved and friends. 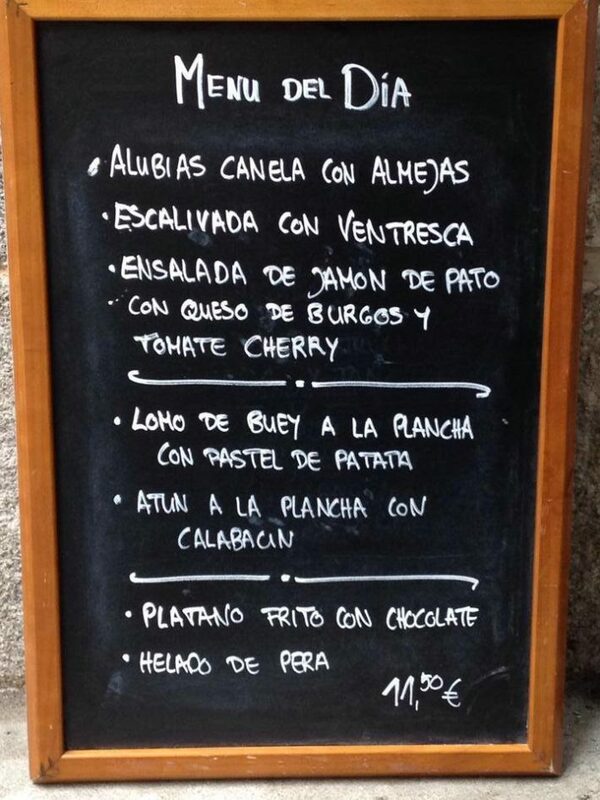 Do it like locals: In most cities in Spain, including Madrid, customers usually get a free tapa when ordering a drink. Nevertheless, it is not the common thing in Barcelona. You may get a bravas (spicy potatoes) or some chips when ordering a drink. Otherwise, try tapas route to savor different types of tapas and a drink at very low cost. There comes dinner, as your stomach is demanding. Spanish does not have a heavy dinner unless it is a special and occasional day. Dinner at home is simple with fish, soup or just salad. Nevertheless, when dining out, people tend to order meals that are much heavier with drinks. As dinner is meant to be shared so that members usually order one racración each person and share the plates with everyone. Dinner begins at 9pm or 10pm and it varies during seasons when the daylight is longer in summer. During weekends, it may even later at 11pm or 11.30pm. For tourists, it is no more difficult than starving and walking around to look for a restaurant. Consequently, more and more restaurants are open earlier to welcome tourists. Do it like locals: If you are traveling with your friends or family, order raciónes (large plates or different dishes) to share. 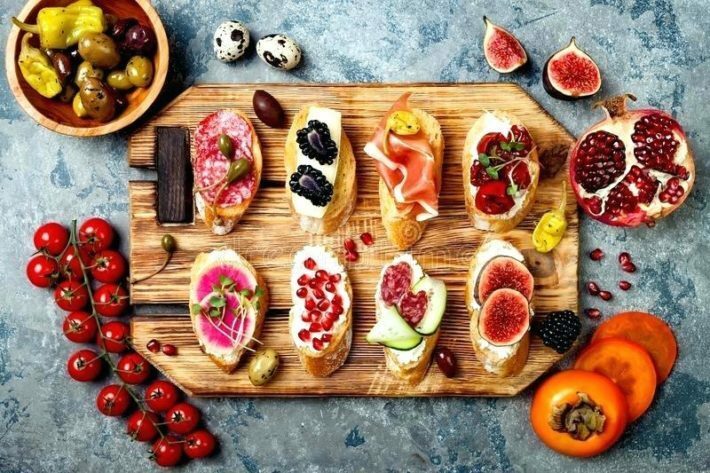 The best way to enjoy aperitif is to nibble your favorite wine with some pieces of cheese, olives or jamón as a snack. Tipping is not the norm in Spain. Spanish do not rush so take your time. Even though, restaurants on weekdays tend to serve faster.